Oh dear. Better late than never... I've been under a self-imposed writing rock since October, and a lot of things, like having another two issues of The Creep coming out, slipped by. They both have absolutely terrific covers from Ryan Sook and Tonci Zonjic, respectively. Check them out! There's also a hardcover collection of this series set for release next year (April, to be exact), using that lovely cover from Tonci. Looks like you can pre-order it through TFAW. In addition to writing, I also completed my largest painting yet, for the Hawthorne Modern Man Barbershop here in PDX. I couldn't be more excited about this, as it's one of my favorite businesses in Portland. More on that, and other bits from under the rock, soon. Look at that! A Mike Mignola cover on one of my books. Like most everyone, I love his work, and feel pretty honored to have it gracing The Creep #1. Tomorrow, you can pick this up, get it signed by moi, and have a beer and something to eat courtesy of Things From Another World on Broadway and 28th, here in Portland. The party starts at 7— head over here for the details. 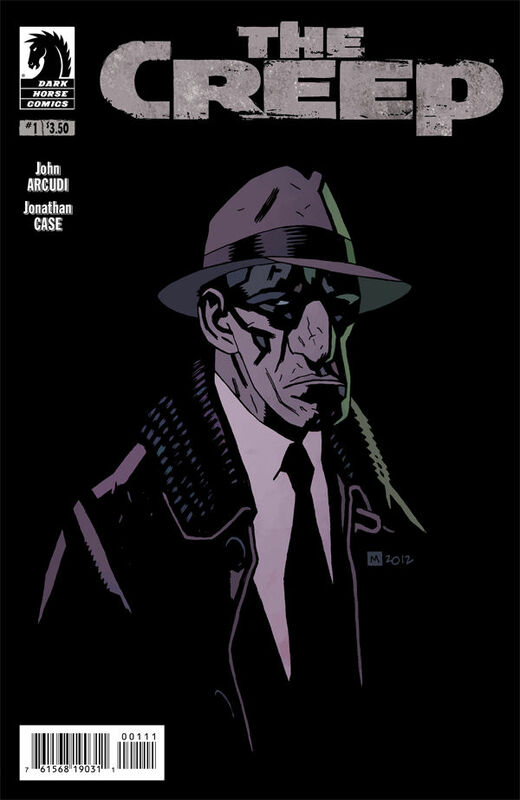 This week, I officially wrapped up my art duties on John Arcudi's wrenching neo-noir, The Creep. And yet ... the world's hardly begun to see it! That changes in September, as issue #1 of the Dark Horse miniseries comes to comics shops, following August's issue #0 (a collection of three segments we ran in Dark Horse Presents). It'll have a fabulous Mike Mignola cover (!) and a sweet release party/signing/gallery at the Portland Things From Another World store (Hollywood location). I'll be there September 12th, from 7 to 10 PM doing the requisite signing, and they'll have a gallery of my work up all month, featuring pieces from Dear Creature, Green River Killer, The Creep, and more. I may even put some of them up for sale. If all that's not enough to get you out there, I have four words: FREE FOOD AND BEER. If you're near Portland, come out and enjoy swell comics folk, drinks, and 80's neo-noir-themed-hors d'oeuvres. Just kidding. But I wouldn't put it past Elisabeth, the TFAW master of ceremonies. She does it up right. In related news, I'm happy to hear that a lot of you enjoyed issue #0. You crazy kids, you. Thanks for all the help getting this book noticed. And remember: the more issues of The Creep you read, the more sunlight you'll need for basking in afterwards. I promise. The Creep #0, Out Today! It's Wednesday, and that means new comics! Today sees the first issue release of my project with John Arcudi, The Creep. If you like noir, deformity, unrequited love, and visits from mysterious dream-bears, this is your book. Issue #0 collects the three segments run in Dark Horse Presents, wrapped up with a tidy Frank Miller cover. Right now, I'm finishing up the last couple pages for the miniseries over in beautiful Pacific City, Oregon (good thing, too, because this story goes WAAAAAY dark). I'm also putting a signing/gallery of original art together with Things From Another World in Portland. Details to come soon. Between that, Rose City Con, and New York Con, it's gonna be a busy fall. Silly me. I wasn't even paying attention, and then this month's Dark Horse Presents comps arrived. Here's a panel from my work in there, the second installment of John Arcudi's The Creep. The issue also has a bunch of great stuff from the likes of Carla Speed Mcneil, Steve Rude, and others. Definitely one to pick up. This month I turn 30. The 20's were good. 29 particularly so. A new baby girl, two books published, steady freelance work, and a great road trip in our crazy old van. There she is, in all her mismatched bumpered glory. Next time, I'll post art, but for now, you get an 80's van. I think you win. If you want to win big, though, you can meet the new older me at Emerald City Comic Con, where I'll be boothing at #223. Want commissions? I will do commissions for you, sir or madam. I'll also have copies of Dear Creature and Green River Killer, plus art prints. And I'm in Monsters and Dames again, too. Speaking of Dear Creature, it just got a starred review from Library Journal, which is a good thing. I love librarians. Someday I want to write a musical set in a library. There will be lots of soft shoe and shushing noises. And now, I'm off to The Creep for Dark Horse. Pencils, pencils, and more pencils. I must fly!